Many organisations have an idea for a certain product or process, yet are unsure of the best process or technology to realise or develop it. ECN can help you with a practical and well-thought-through design. Make use of our engineering expertise, knowledge of materials and infrastructure to transform your idea into a design, working prototype, device or installation. Read more in the brochure on test rigs. If your installation or product is not performing as well as it should, you want to know why. ECN can help you find the cause, either on site or in a simulation at our own facility, and also present suitable solutions, by carrying out an independent and objective investigation. Our years of experience have taught us the importance of the cohesion between design, production, use and circumstances on site (which are often disrupted). ECN also offers advice for equipment repairs or optimising your product or process and carries out tests on the redesign. Read more in the brochure on equipment failure research. It can be difficult to predict corrosion behaviour during use beforehand based solely on material or coating characteristics. Take advantage of ECN’s knowledge, experience and innovative testing methods and simulations to help you make a well-informed choice. By linking corrosion behaviour to factors such as construction, process conditions, maintenance and cleaning, ECN can perform corrosion analysis for your application within one week. This way, ECN is able to use just a few days of monitoring to predict corrosion behaviour over several years. This provides you with advice or a solution in which corrosion speed, safety, costs and maintenance have all been carefully taken into account. Read more in the brochure on corrosion tests. What is the most suitable technique for joining your materials? The choice of joint depends on your specific process or the ambient conditions. Temperature, pressure, chemical gases or liquids and non-standard materials are all important aspects when considering the best solution for you. ECN can help you with its extensive in-house knowledge of joining technology, such as welding (including weld qualification testing), soldering, bolting, riveting, adhesives and more. Our experts can give you the advice you need for your specific joining application. Read more in the brochure on joining technology. Do you have an idea for a product but you are not sure of the best technology or process to realise it? Or maybe you have a new process but don’t know exactly what materials you can use. Then ECN can give you the advice you need. Our knowledge of materials, chemicals, engineering and process and production technologies enables us to provide total, optimised solutions. Read more in the brochure on manufacturing technology. ECN’s laser systems are fully equipped for laser treatment of ceramics and glass, sub-micron treatment of surfaces, selective laser ablation, texturing, cutting and laser beam welding. Our laser technology services include advice, making single products or small series and developing laser applications. Read more in the brochure on laser technology or the overview of laser systems. What is the composition of the contamination on your product? What is the pore size distribution of the activated carbon that you have produced from a new raw material? And what is the gas absorption capacity of that same activated carbon? 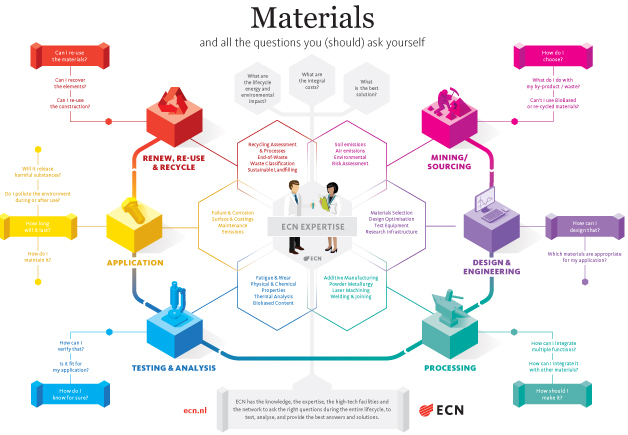 ECN can provide you with answers to these questions and more through its physical characterisation service. Taking measurements under difficult conditions (dirty, high temperatures etc) is no problem at all for ECN. More information is available in the Equipment List. Is your material hard enough for the application you have in mind? And is the tensile strength sufficient? ECN’s mechanical testing service can provide the answers you need to these questions. Do you need to know the chemical composition of a fly ash? How much hydrogen a test rig produces? How many heavy metals are in your waste water? ECN uses its ISO17025 accredited chemical analysis procedure to answer these and many other questions. Is your plant functioning optimally, with maximum yield? Are you experiencing problems with your firing process? Or would you like to know how changes to the fuel or your plant affect gas composition? ECN is a specialist in sampling and analysing fuel and flue gases and in plant optimisation and has wide experience in measurement and sampling, even in difficult conditions. Our gas analysis service can help you ensure your plant is operating at top efficiency. Read more in the brochure on gas analysis. More and more products are being made either fully or in part from biogenic (organic or biological) materials. ECN has the knowledge, experience and facilities to reliably establish how much of your raw material is biogenic in origin. To provide this service, ECN has developed the 14Credits tool. Here we take samples of your flue gases which we then analyse in order to establish the biogenic content of the energy and CO2 produced. Depending on local government policy, the results of our analysis can be used to claim Carbon Credits and/or subsidies. Read more in the brochure on 14Credits. Tip: Are you looking for a specific process, analysis or equipment? The Equipment List shows all equipment ECN has at its disposal. Are you interested in how ECN can help you, or would you like more information on our products and services? Then please contact us.